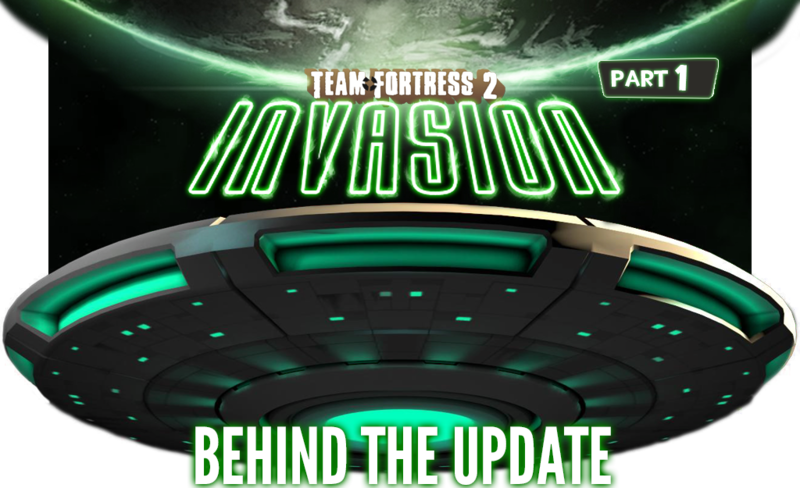 Welcome to the official behind-the-update page for Invasion! It took many hours of blood, sweat, and tears to bring to fruition (the update, not this page). We’d like to share with you the project’s origin story as well as how the movie, the maps, and the items came about. Night after night we sat there glued to our screens. Our faces lit from the false light of this game we love. For more than two years they planned, they built their rockets, their suits, their weapons and their maps. Until finally the day came. Now, for us all, it is too late; they are among us. And we are grateful to them all. May of 2013 - Robotic Boogaloo was released, the first entirely community made Team Fortress 2 update. Even before the finely ground metal flakes had floated gently to the floor, lovingly scraped from the latest in digital millinery, there were those who looked on with envious eyes. The best ideas are often the simplest. With robots and zombies taken, there was a glaring void that Team Fortress 2 lacked from the first person shooter genre. Aliens. The word alone brims with possibilities. The Ronin (the man who was to became the Overall Project Manager for this Invasion update) had missed out on Boogaloo but was determined to be involved with a project. He wanted to see more than just another sleugh of cosmetic items though. He wanted there to be truly diverse content, maps, weapons and more. His first port of call was to the mapping community. By encouraging them to hold a series of seemingly innocent contests, such as the TF2 Maps “Mercs vs Aliens” summer mapping contest, he was able to source out some talented mappers. Getting them on-side would prove to be a win-win for everyone since he now had some valuable connections and the outlines of a map or two to build on. There was never a guarantee from Valve that this update would be picked up and made real. In the event that it wasn’t accepted, the idea was to release the community’s work as a big fun weekend. Making a community update is a daunting task. Anyone can have an idea and write it down, but an idea is just the beginning. A project lead must do more than merely possess an idea. A project lead must not only be able to deliver content themselves, but persuade other people to join in making content with the distinct possibility that at the end all their hard work could be for naught. Even so, once you’ve convinced them to join in, you still have to keep them on track, keep everyone moving forwards, and try and keep them all together on a journey that has no definite end date or guaranteed reward. The Ronin (we’re going to call him just “Ronin” from now on) was the proverbial Man With the Plan. Robotic Boogaloo was the first update which was 100% planned and executed by the community. It was a cosmetics only update with the premise of robotising well-known and popular hats and it broke new ground as to what the community thought of as being possible. For the Invasion update, Ronin wanted to take things to the next level. Cosmetics are a big part of TF2 and no update would be complete without them, but he wanted to sink his teeth into providing some actual playable content, maps. It’s worth noting that a lot of these plans were hatched before End of the Line was being considered for a community update. He already had friends in the item creation community from his own work there. This was a chance to bring together all of the major content-creating communities of Team Fortress 2, with everyone playing their part. Ronin’s vision for Invasion was going to require involving a much larger segment of the community than Robotic Boogaloo ever touched upon. However, to do so would create an interesting dilemma. On the one hand, you want to get the community excited enough to join in, but on the other hand you don’t want to reveal so much that when the update is released people don’t see anything new. Subtlety and caution would be big players in bringing people on-board, without revealing everything to the community at large and ruining the surprise. Ronin started reaching out to different communities, different groups of people and began quietly bringing people on board. One of the first of whom is Bang!, now co-director of the project. Bang came with a lot of contacts in various communities and a lot of skills to his own name. Bang’s influence touched many different segments of the update, from planning and orchestration of the update, to SFM and mapping. What update would be complete without a shed load of highly coveted Cosmetics? Well, other than Valve’s gameplay balancing updates. Or their updates before they implemented hats. Or– look the point is, Invasion would not be complete without cosmetics. Early on in development, items were originally being developed for the SFM with the intent of being converted into cosmetic items. However, this is a community update, so it needed an injection of items created by the community at large. 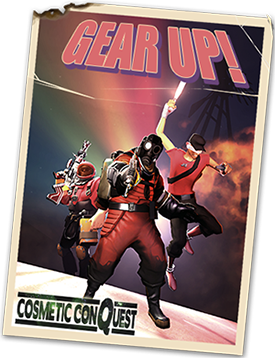 From this need, the Cosmetic Conquest Contest (try saying that five times fast) was spawned. Facepunch has been the home to many a themed item creating contest in the past, so it seemed like a natural place for people to flex their creative muscles. 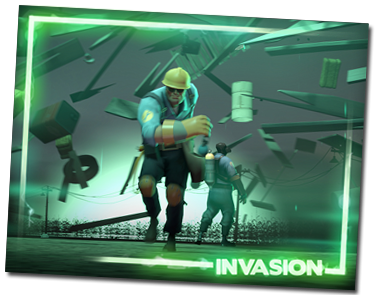 When the contest was launched, nobody had heard the name “Invasion” and nobody knew that this was intended for an update - exactly according to plan. The contest was launched by Ronin and Bang and run by Void. Void is a well known item maker who contributed some long needed hotpants to TF2 and was the excellent man behind Meet Your Makers, an in depth look into the world of TF2 community content which was recognised and honoured by Valve with a main-page blog post. Void also contributed a metric buttload (which I am told is the equivalent to 63 US gallons) of items to the update. If you’re wearing one of the new cosmetics, check the label and see if “Made by Void” is stitched in there somewhere. Wearing a Void-label jacket is the TF2 equivalent of wearing real world Roberto Cavalli, Versace or Alexander McQueen. “We spoke to Void whilst he was at the gym once. Make sure you write nice things about him, I don’t want to get beaten up!” - Tempest, probably. Void was also willing to put his money where his mouth was - he put up his own money with $100 for the first place winner, with $70 going to second and $40 to third. The contest ran until October 8th, 2014, giving people just over 3 months to put their ideas into practice. Ideas were plenty - ranging from Modern Movies to Sci-Fi comics of days gone by. Think “The Blob” attacking “The Flash” and everything inbetween. It was quickly assumed that this contest was inspired by or in association with the Moonbase update, which Valve had only recently put into beta with the Robot Destruction map Asteroid. Although the two have never been related, the look and style of 1940’s zeerust was just the direction invasion was hoping for. Those with particularly fetching cosmetics were contacted and discreetly brought into the fold. Invasion’s cosmetics wouldn’t be limited to hats, jackets and shoes. These items alone are not enough to dress a person of truly impeccable taste. No, you must add what some might call a certain… “je ne sais quois”, or others might call “pretty glowy things!” - though the technical term term is “Aurora Unusualis”, they are more commonly known as “Unusual effects”. We’ll be honest with you here. We are reasonably sure that ChaoFanatic is actually a witch. We haven’t had a chance to do the “does he weigh as much as a duck” test, but anyone who can do a good job of particle effects is a strong contender for “Witch of the Month” (Note: While receiving the title “Witch of the Month” is a prestigious award in it’s own right, it does not in fact entitle you to a Lo-Fi Longwave, despite rumors to the contrary). Also, I think we saw him floating. Chaofanatic’s body of previous works speaks for itself - however, seeing as how this is a primarily text-based page, we’ll save you some effort: From Robotic Boogaloo we find the atomic green Anti-Freeze (one of the few effects that stands up alongside Scorching Flames in my opinion) and Power Surge (which I have always thought of as “an orbiting effect done right!”). End of the Line brought us a less lively, but equally gorgeous, set of effects, such as Frostbite (of which the only downside is that no one will stop telling you that you have a “cool” effect, groan) or Death at Dusk (which is by far and away the single most gorgeous weather-themed effect in the game, hands down). For Invasion, Chaofanatic was allowed to unleash his unearthly talents once more and I can tell you this now - he does not disappoint. For starters, he helped create some of the visual effects you see in the SFM produced for the update - custom particles that flash and swirl - strong enough to have a noticeable presence, but gentle enough that they aren’t flashing obnoxiously in your face. He also produced custom effects for pd_watergate by Egan, lending the map its own personal flair, making sure that Egan’s map has a flavour all of its own. His unusual effects are truly eye catching, purple nebulas floating and twinkling gently, much like the swirling clouds around a certain Lo-Fi tower featured this page which unsurprisingly is also his work. Near the beginning of the process, Ronin approached Ruskeydoo to see if Kritzkast could work on PR for the update. Ruskeydoo said that they could do more than that, and thus inadvertently committed them to making a radio play. At this stage, the Movie and radio plays’ main goals were to build hype and get people interested in building maps or items. We advised that the Radio drama could be the narrative, outlining a "Story" of the alien invasion on the world of TF2. The radio play was broken into three separate sections, with the intention to play them daily as part of a 3-day update. Each day was selected to reveal one particular aspect of the update, and the radio play was going to mirror each day’s particular reveal. Unfortunately, due to the structure of the update, the audio was not able to be utilized officially by Valve, but we were able to release the first play, “No One Would Have Believed,” as a teaser a few days before what was originally intended to be the update’s release. In Part 1 we introduced you to the characters that would be used throughout the Audio drama. A fake Audio play, similar to the one in movie was used as a program for an Emergency broadcast to interrupt. Steps were taken to not reveal that Aliens were the theme of the update, But hints at several possibilities that did include aliens. In the original Schedule, the movie would be shown after part 1 but before part 2. It was an active choice not to emulate the mercs, but create new and original characters that lived in the TF2 universe. Some of the reasons for this choice included trying not to step on the toes of the ongoing comic series that had only released its 2nd issue at the time of writing. Plus it gave us more creative freedom with the characters. However many references to the TF2 story and universe were used in the Audio Drama. There were even references to the End of the Line update, which had yet to be released at the time of recording.